Best Out Of Waste Ideas: Evolution of mankind humans have been capable of creating anything from something, so get the best out waste ideas for DIY art and craft. That being said this evolution of man has also resulted in the unmountable quantity of garbage. This results in recking the environment and has also been the prime cause of numerous diseases which can be very hazardous to health as well. 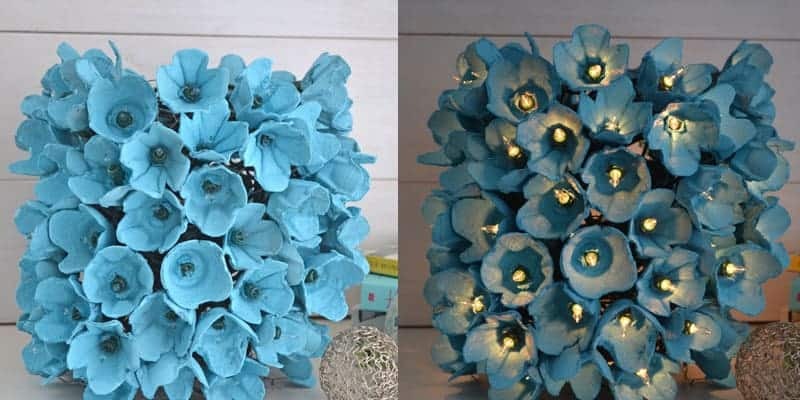 But this problem can be converted into the solution through some innovative ideas and basic techniques, and can very easily be used to make beautiful household showpieces which will bring out the hidden artist in you. Furthermore, we will discuss the Ideas for crafting the magnificent piece of art from the waste which we produce on daily basis. The odd-looking tray which u thought was ugly and can only be used to carry eggs has more use to it than just carrying eggs. Cut the cup from the carton, slightly trim the edges of cups making them appear like four petals. This needs to be done by adults as it requires steady hands. Bring the spray paint can and paint it from the inside as well as outside the cup. Light bulb needs to be pushed through the hole provided by chicken wire and use a floral wire to safely secure it. The chicken wire needs to be rolled in a cylinder with the bulbs facing out, Tie the ends with the help of floral wiring. Make a cut in X shape at the bottom of every single one of the egg cups and put a cup over the light bulbs. The wine bottle is perfect for this crafting transformation but any well-shaped smooth surfaced bottle is also good enough. Kids can perform this task just make sure they wear clothes that are not in use. Wash the bottle cleanly from inside as well as from the outside put the bottle aside to let dry out. Take the syringe and fill it with paint and squeeze it into the bottle, shake it well to make sure the paint expands at every corner of the bottle. When the colour has covered every corner of the bottle place in Oven at 302 degrees Fahrenheit for approximately 35-40 minutes. 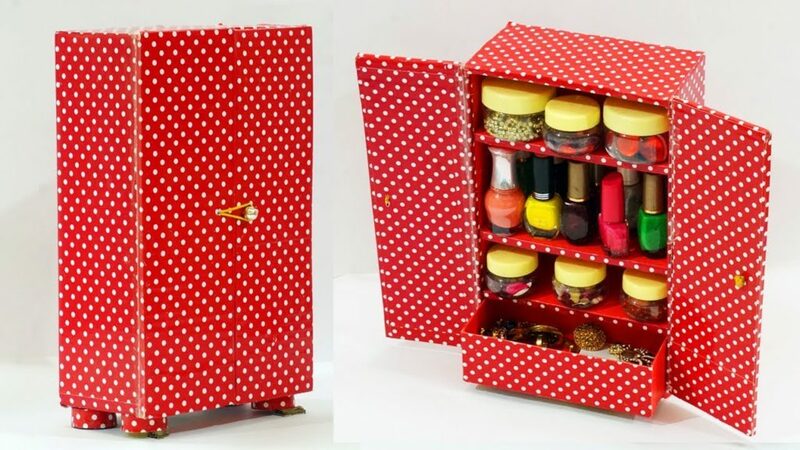 The box whether for shoes or storage is always have been used and are environment-friendly. It is the most commonly found item at every house. Cover the outside of the box with cuttings of cartoons from the newspaper. Tightly seal the insides of the box with Tape. Try to create some interesting image out of the cuttings at the top of the box to create some sort of beautiful effect. Take the soda can and crush it hard (adults need to do this) and make it as flat as possible. Place the flattened aluminium at the top of the box and write the name of stuff that it’s going to store or your name as well and it’s done. Hope you liked this best out waste craft idea. 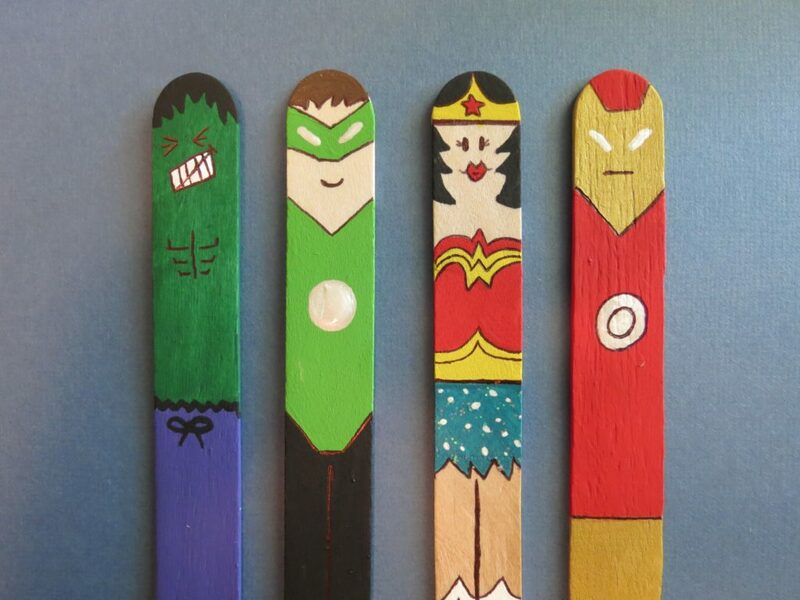 The most famous superhero franchise can be used to create bookmarks for your child to make learning even more exciting than ever. Draw the favourite character you like or have your child do it. Use the skinny brush to paint out details on the character. Pen out the details on the drawings if u like more details on the character. Coating of sealer is required when the colour dries out. Most useful on the list and probably it is the most convenient and easy to make handcraft which also acts very useful for day to day purposes. To make this best out of waste ideas you will need following items. Strings in any available colour. Wrap the one end of the string and put Glue on the other end. Adult supervision is required. Take a coloured string and start wrapping till the end of it, stick it up with glue. Do this at the other end as well. Repeat this process until the entire length has been covered. Compact disk has a unique shape and texture and has a great scope to be recycled into a crafting masterpiece. Spread Glitters on the glue leave it to dry out. Carve out the face, fins and mouths and stick on the back using scotch tape. Now put the googly eyes with the glue. Wastage of time is considered to be as purposeless as wastage of any resource around us. One of the most important resource is plastic which should be reused, reduced, and recycled instead of wasting this resource and let it harm our environment. So here is an article for people of every age, right from small kids to the old generation. This article will be suggesting you all about how to make use of one of the common form of plastic, that is, plastic bottles. 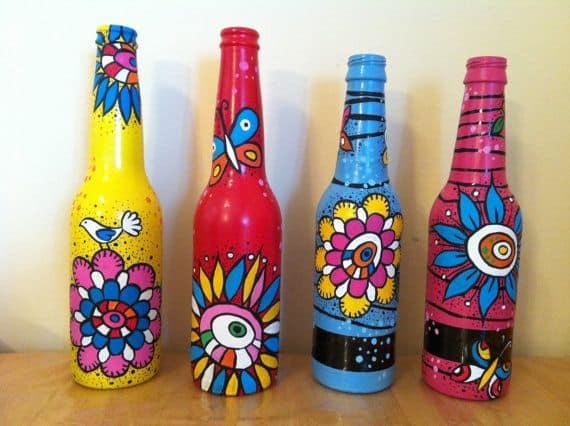 By going through this article, you will be made more creative in case of changing a waste plastic bottle into an interesting artwork. Let’s get started up by our first item and then so on. This is our first item made out of bottom of the waste plastic bottle. For making this bottom bottle utility bowl you require some easily available waste material which includes, a plastic bottle, a pair of scissors, acrylic colors, fevicol stick and an iron. So let’s start up with this by cutting out the bottom of the bottle using a pair of scissors. Now when you cut that out, you will get some rough surface from that part where you have cut it out. So to make that part smoother, touch a hot iron to that part for few seconds. Now after the smoothening of the bottle’s base, apply fevicol evenly so as to make a base to proceed for the further decoration. Let the fevicol base get dry. After that, add some acrylic colors to your fevicol tube and mix it well. Now to the prepared bottle bottom, make a desing using coloured fevicol tube, of your wish and let the whol structure dry. Here, your bottle bottom utility bowl is ready to take place onto your centre or dining table. This will not only save the wastage of plastic bottles in your home but also will make the best out of waste material plastic and will save the environment from the evil effects of plastic. The next item of our interest that we will be making out of a plastic bottle is a plastic bottle spoon stand. This is the widely used utility product that could be carved out of a waste plastic bottle. This will help most of the women or there in their kitchen to place their cutlery at a same place. So let’s get started with our first item, that is a c bottle spoon stand. For making such a stand you will require just few materials like a plastic bottle, a pair of scissors, glue stick, etc. By now u have learnt these simple yet innovative crafting techniques using nothing but the waste, which earlier had used at all. We can apply these simple hacks to make the unused goods transform and learn and encourage others around us to craft more amazing useful stuff for our kids and make a better environment and also promote recycling of goods. If you are here, then you must be looking for making DIY crafts out of waste. Best out of waste is the new thing on the internet where DIY projects for school, home decoration, gift, and competitions are made from the waste things lying in a home, garage and working area. You can make use of them by making best out of waste ideas given below. At the end of this page, you will know the various way to make use of waste in your home that can be used for decoration, gift and for other purposes. Let’s get started with how to make creative things from waste material at home. Best Out Of Waste Ideas For Class K.G and Pre-school KidsAn easy way to teach your small kids the art & crafts and make them creative with our Waste item craft which can be found in the home. Small kids have the ability to learn and grasp any thing taught to them, so make use of it by embedding the art of creativity in them easily by using our list of ideas to create art and items from waste material.Class KG children are curious to learn new things and have many questions in mind. So you can teach your child new things by art and craft which is the practical way to learning. DIY is a technique to learning for a long term. Top DIY Best Out Of Waste From Newspaper to Decorate HomeThe newspaper is the most used and waste household & office waste item which at the end, end up is sold to a scrapper. so why not make anything use full out of it, by using our comprehensive list of Decorative things from the waste newspaper.